MARINES, NAVY SEALS, AUSSIE SURF LIFE SAVERS, USMC COWBOYS! ...hot men working and playing HARD! U.S. and International © Copyright Law. Navy Seals running in the USMC Volkslauf (Mudrun) at USMCAS Tustin, CA. This "Boatie" hikes his swimmers up his bum so he won't slide on the rescue boat's fiberglass seats. 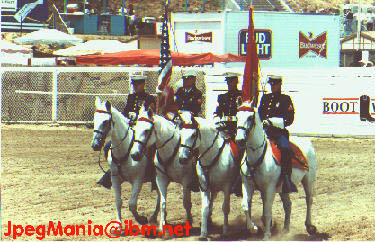 The Mounted Marine Corps Color Guard signal the start of the USMC Rodeo at Camp Pendledton, CA. ** LINK TO THE ORDER FORM....Please fill out and mail this form, thank you. U.S. and International © Copyright Laws.